Harmonica Yokochō is a West Tokyo drinking district next to Kichijōji Station on the Chūō Line. It was so named because on a map, its long, skinny rows of alleys are supposed to look like a harmonica. (They actually look more like square jack o'lantern teeth.) 🎃 Along these alleys are dozens of bars, most of them small establishments that only seat a few people. Bar Hanachan (花ちゃん) is one of these. 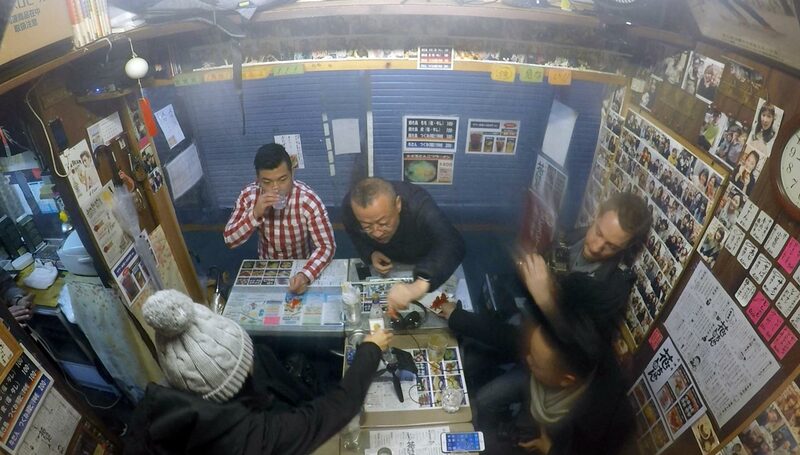 It's a tiny, kitschy place—maybe "hole in the wall" is a better way to describe it. Whatever its size, it has a distinct personality and, as of this writing, I've been there four times. 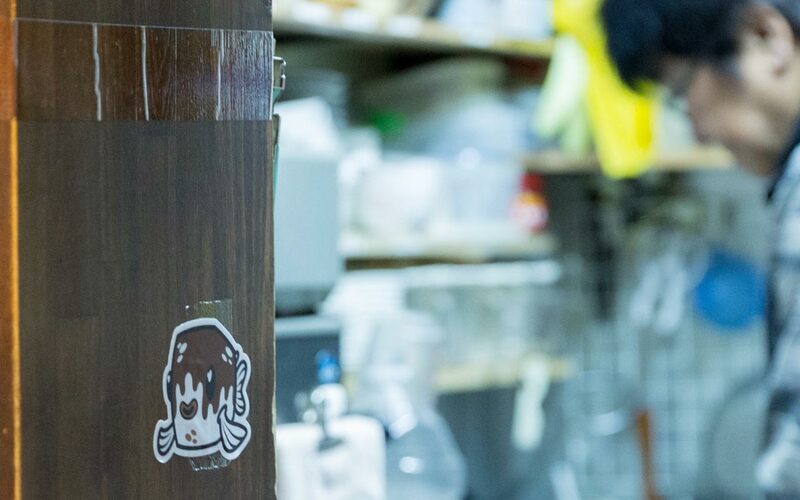 We originally discovered Hanachan by chance: it was in 2016, when the Tofugu crew was looking for a place to interview an ossan we had rented whose name was Omocha-kun. The four of us had ducked inside its thick plastic curtain that divided the small seating area from the rain outside. We grabbed a table and asked the proprietor if we could do our interview. He immediately began to lecture us. "Well, that depends," he said, looking extremely offended. "You can't just walk in here and ask that. You see, you're taking up valuable seats, and this isn't a big place. You should have had one person come in and ask first instead of just sitting down. Also, I don't know if you're just going to be interviewing him and not really ordering anything. With a small place like this, you need to consider those things before settling in." As he spoke, we nodded a lot and apologized. He seemed to begrudgingly accept that we were going to patronize his bar. "Anyway, let's get you all drinks. What will you have? Please order a lot." This practice of lecturing customers continued all night, and I actually grew to enjoy it. The owner didn't seem to care at all, and clearly felt free to say whatever was on his mind. It's not that he was being judgmental; he just seemed to like telling people what they ought to do, whether advising them on tiny things like how to eat something on the menu or weighing in on the larger, life-sized problems that his customers were trying to drink away. Because Hanchan is so small and cramped, conversation is encouraged, if not mandatory. In between filling orders for food and alcohol, the owner would sit with his clientele, his face red, gripping a beer-filled mug. At this drinking spot, people actually converse. Really. According to its proprietor, the inspiration for Hanachan came from Shinya Shokudō 深夜食堂 (Midnight Diner), the manga series by Abe Yarō. If you look really closely in the picture above, you'll see some books in the top left corner. They're all Shinya Shokudō. If you're familiar with the series, you'll recognize subtle references to it all over Hanachan. The owner is always trying to fix people's weird problems. 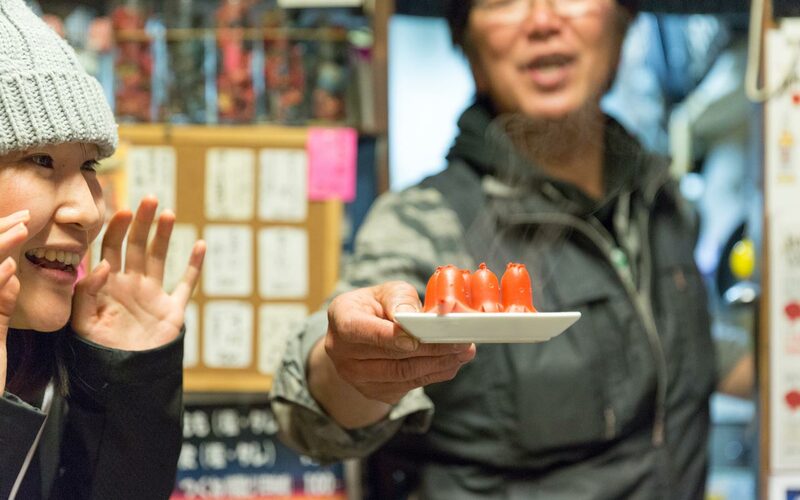 There are menu items that mirror some of the famous foods served in Shinya Shokudō. And everyone drinks too much and gets into each other's business. It's pretty great! Tabelog, Japan's version of Yelp, sums up what Hanachan is best known for in a single phrase: 大人の会話—"adult conversation". That doesn't mean its patrons are talking about the bembis (tee hee) or the booboos (snicker). It's referring to the fact that at this drinking spot, people actually converse. Really. They don't stare at their phones or read. 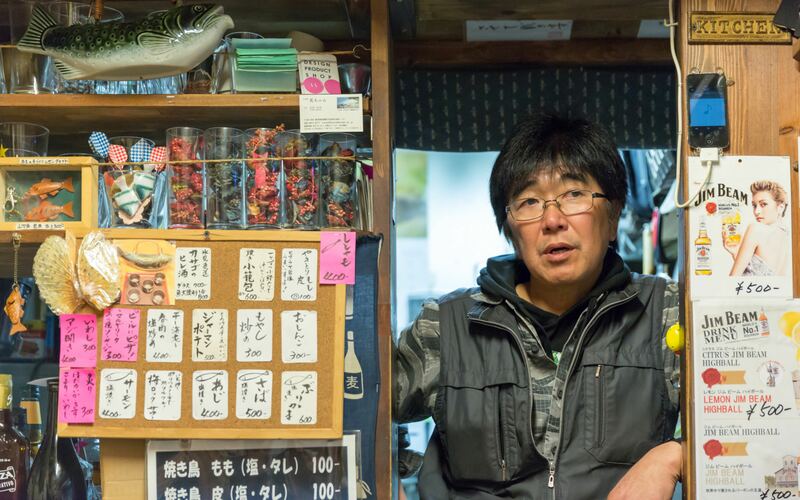 If you come to Hanachan, expect to talk to people, even sometimes the owner himself. The customers can be interesting, though hit-or-miss. All kinds of people walk or stumble in—it isn't an exclusive club. But that's part of its appeal. When the Tofugu crew visited the first time, in addition to our ossan, we spoke to a designer at Muji (where it turns out Hanachan's owner used to work but wanted "out of the rat race") and met a personal trainer who flexed for us, on request and not on request! The reason to seek out Hanachan is for human interaction. On later visits, I met up with all kinds of people: Tofugu readers via open invitation, random salarymen and women, folks who were just bored and needed to talk. For those who live alone and don't have many people to talk to, Hanachan serves a positive purpose. The alcohol helps, too. How good a time you'll have depends largely upon who is there and whether you're okay with the owner, since his unique personality can offend some people. There's nothing fancy about the place, and the food isn't even that good (though I've become a fan of the miso cream cheese blocks and the hot dog octopi). Hanachan holds a weirdly special place in my heart. In a place so small, human interaction is an inevitable part of the design, and I love it. Hmmm. The more I describe Hanachan, the more it sounds like a terrible place. And maybe it is. I don't think you'll like Hanachan, to be honest. But you don't have to. When I returned for second, third, and fourth visits, it was more of the same. Despite all this, Hanachan holds a weirdly special place in my heart. In a place so small, human interaction is an inevitable part of the design, and I love it. I like people, even the folks who are merely there to drink their troubles away. I find talking with them about their problems, my problems, or just weird topics is an enjoyable way to spend time. Hanachan scratches that itch. In the end, I think the quarrelsome owner forgave us and our ossan for barging in without asking. We did end up ordering a lot of drinks that night, and even bought some for other patrons as well. Before we left, he even let us put one of our world-famous Tofugu stickers on his wall and, two years later, it's still there. That says something. When you go, if you go, if the conversation lags, be sure to look around for the mark we left. Hope to see you there sometime! I can’t say that Hanachan is “good”. Not by any normal standard. But, for me, it’s someplace I enjoy coming back to. Its unforgiving focus on getting people into interesting conversations is more important to me than good food, drinks, or plenty of space. Although it’s not the bar where everyone knows my name, it’s a place where it feels like everyone’s your closest friend in the world. For a couple hours, at least. Might have rated this a 9 if I could remember the second half of the night. I wouldn’t say there is anything unique about this place. Great company and no-frill drinks and food is the expectation here, and that’s all one really needs. 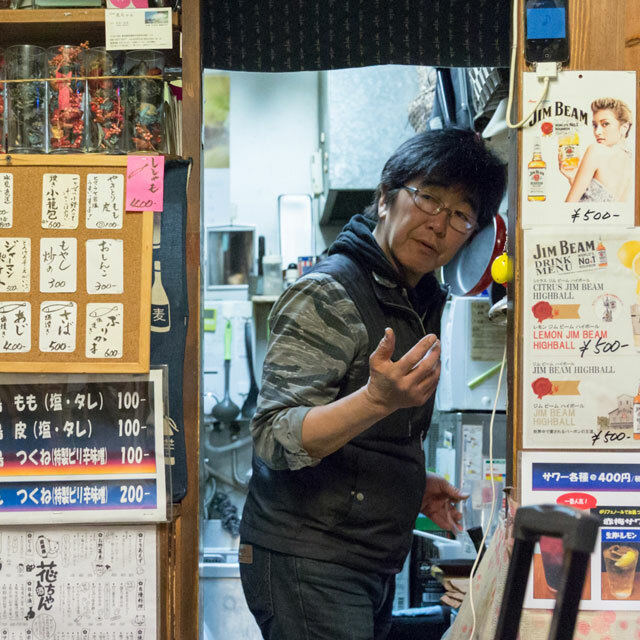 I like tiny bars like Hanachan and meeting people and enjoying fun times together, but I wasn’t a big fan of the owner’s lecturing, to be honest. Like Koichi said, he really says what’s on his mind. He told me to take off my hat because he thought I looked like a scary person with it on, and I thought that was a bit rude. Even though he has soft drinks on his menu, he was not happy when I ordered one, and I had to change my order to something alchoholic. Then, when I ordered a chu-hi, he recommended something else that he thought was better. Later, when I ordered fugu fin sake, he again recommended something else he thought was better (pretty strongly). Don’t get me wrong, his recommendations were good and I enjoyed them, but I felt a bit uncomfortable that I couldn’t order what I wanted because of his very “strong” recommendations. I still enjoyed the people, drinks, and foods though, so my rating is a 6.